Uttapam that way is very versatile and accommodating….taking under its wing (quite literally) a wide array of vegetables….the only condition i can think of, is for the vegetables to be chopped fine so that they do not stick out from the batter like a different entity…..onions and tomato are the most popular accomplices of uttappam …. But beans, carrot, spinach and cabbage too make worthy counterparts. Heat the tava / griddle. Mix all the ingredients together and spread a large spoonful of the batter onto the hot griddle. Spread slightly but not very thin, batter should be spread to about 1/3rd of an inch. Drizzle a little oil around the uttapam. Cook on medium heat till the sides begin to turn brown. Flip over and cook for half a minute. Serve hot with chutney / sambhar. Previous Post Am back……from Maldives!! Sugar and spice makes all that more nice. …lol…proudly. ..south african indian…enjoying. india recipes. The best way to start the day with a delicious breakfast. Hi there Arundati…looks like you’re back in business & cooking! Killing 2 birds with 1 stone…hmmmmmmmmmm? Hve bookmarked the recipe coz I love uttapams & will feed them to the kids (hopefully) during the Easter break! Yr uttapams look really professional!! YUM YUM!! Dear Seena, welcome to Escapades and thanks for stopping by….. thanks for the words of encouragement!! I don’t think I’ve ever had uttapam, but I am sooooo sold now. My husband and I LOVE dosas, so anything fermented and related to dosa has our utmost attention. 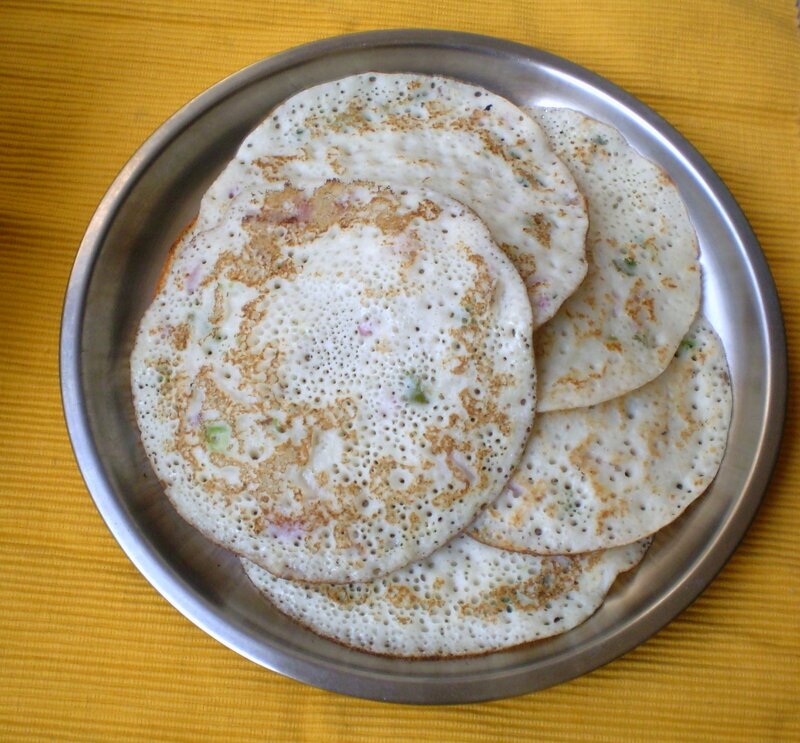 I think I will have to learn how to make dosa batter from scratch and then make these. Thanks for the great recipe! hi bri, thanks for dropping by….once you get to making it from scratch, its pretty simple and such a life saver!! try it!! I love uthappams too but my version has lots of fried onions … yours look so spongy and yummy. hi Lavanya…..i’m not partial to too much onion…so mine has it in small doses…..
do it babes!! isnt it some time ago we agreed it was such a life saver?? The first few lines are so true….you realise how much your mother does only after you get married and start doing all that yourself. nice entry for both the events. thanks jayashree…..i wondered for a while if i was the only one wanting to clobber bell ringers!! hi rupa…..thanks…and i agree with the anytime is uttapam time too!! Arundati, I love onion uttapam, and your post brought back some lovely memories of eating this in Bombay’s udupi restaurants. I haven’t had it in a long time, though, and you’ve inspired me to try making my own. They look delicious! hi vanamala, welcome to Escapades and thanks for stopping over…. Love ur uttapam , it came out so well…. Perfect Arundati! wonderful way to kickstart the day:) thanks so much for sending these in!! hi Mansi!! what a beautifully resourceful theme you chose….. cant wait for the roundup!! Lovely utappams! Mmm. I can smell them. 🙂 …..what?? really?? the chimney has been on for a while now!! oh!! cheese and tomato are my ultimate favourites!! but i dare not indulge in it too often!! it gets addictive…..i agree babe, that they taste great cold too…. hey thats a gr8 entry.uttapams are my all time favourite. Uttapom is my hubby’s favourite. hi HC, i agree……….they’re actually good for anytime…breakfast, lunch, dinner or anytime in between!! nice & yummy, i love uttappas! hahah…so finally you managed for two events…great…uttappams look great! yes i did!! this time i get a ring side view!! cant wait for the round up!! Hey its the same story with me too. I add whatever I can lay my hands on to mask the sourness of the batter. i kind of like a mild sourness…..not too much tho…in our hostel we’d ask each other what the voltage was…depending on the assault to the senses! !